The former police chief of Pumpkinville, Hugo Bugwort, is running for the mayorship of Snort City. Unfortunately, during his speech announcing his intention to campaign, Hugo is rudely interrupted when some dogs knock over a hotdog cart. A bystander, Gertrude LaRue, is injured by the falling cart. 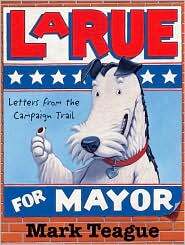 Now poor Mrs. LaRue is in hospital recovering from her injuries and her dog, Ike, is writing to her to keep her posted on his doings. At the moment Ike and his doggie chums are setting up a dogs-only "social club." Ike has made himself the president of the group and they plan on doing "good deeds" in the community. One cannot help wondering what Ike means when he talks about doing "good deeds." All Mrs. LaRue has to do is to find out what her pet is up to is to read the local newspapers; Ike and his friends are causing chaos wherever they go. Ike, naturally, thinks his "cheerful and spirited behavior" is quite harmless, and he is appalled by the reportage in the local media which says that the dogs are "a menace to our community." Hugo Bugwort is determined that the outbreak of doggie problems must come to an end. He even suggests that a leash law, a curfew, and "a ban on animals in most public places" is needed. Ike begins to worry about Bugwort's intentions. Surely he cannot mean to follow through with his threats? In retaliation, Ike writes a letter to the local newspaper in which he criticizes "the anti-dog hysteria sweeping over our city." How far is Ike willing to go to defend himself and the other dogs in Snort City? Dog fans of all ages will have a great time reading this book. Children will love the way in which Ike gets away with his shenanigans, and adults will appreciate the discrepancy that there is between what Ike says he is doing, and what he is actually doing. This is a wonderful companion to the other Ike LaRue titles, which are also humorously written and wonderfully illustrated by Mark Teague.